In March 2017 Crayola has their consumers in a stir once again as their announcement to retire one of their colors from the No 24 box. Now, whether they have said for the first time in history or whether they meant "for the first time on National Crayon Day", this is by no means the first time they have "retired" something from this box. That is, if you take a color disappearing forever as a retirement. Let's look at the history. BLACK, Burnt Sienna, Burnt Umber, Chr. Green DK, Chr. Green L, Chr. Green M, Ch. Yellow Med, Cobalt Blue, Eng. Vermilion, Flesh Tint, Gold Ochre, Indian Red, Madder Lake, Magenta, Olive Green, ORANGE, Prussian Blue, Raw Umber, Rose Pink, Ven. Reds, Ult. Blue, VIOLET, WHITE, YELLOW (note that Chr. is short for "chrome", M is short for "medium", DK is short for "dark". BLACK,BLUE,BLUE-GREEN, BLUE-VIOLET, BROWN, BURNT SIENNA, DARK GREEN, GOLD OCHRE, GREEN, MIDDLE BLUE-GREEN, NEUTRAL-GRAY, OLIVE GREEN, ORANGE, PRUSSIAN BLUE, RED, RED-ORANGE, RED-VIOLET, ROSE PINK, TURQUOISE BLUE, VIOLET, WHITE, YELLOW, YELLOW-GREEN, YELLOW-ORANGE. So in reality, we have only five colors that still have the same name in that No 24 box: Black, Orange, Violet, White and Yellow. Apricot didn't become an color until 1958, Blue has changed its original color twice. Once in 1935 and once in 1949 so the blue you are coloring on today wasn't the blue people colored on back in 1903/1904. Besides, the original box contained Ultramarine Blue anyway. That color was discontinued back in 1958 when they redid many of their colors for the introduction of the 64-color box. Blue Green has only been around since 1930 as that color name. It originally came from a buyout of Munsell Color Corp. where they inherited the unique color back in 1926 as Middle Blue Green. Blue Violet originated in 1930 but has changed its color back in 1958 and was called Violet Blue even. Brown has been around since 1903 unchanged but they didn't use it in the original boxes under the Rubens line, instead choosing to include Burnt Sienna and Burnt Umber instead (and Burnt Umber disappeared back in 1949). Carnation Pink has only been around as a color name since 1958 but the actual color wass the same as Rose Pink which was in the original No 24 box so that color has been there under different names for the entire time. Cerulean and Dandelion are relatively new colors, having been introduction in 1990. Obviously each time something gets added to the box, something goes away. Gray wasn't introduced as a name until 1956 because it used to be called Nuetral Gray and that color was introduced in 1926 and didn't show up until the transitional No 24 box in 1935. Green wasn't in the original box either as they were Chrome Green colors back then (light, middle and dark). Those colors disappeared early (middle and dark in 1910 and light in 1935 during the transition box. Even the original Green from 1903 changed color in 1930. Green Yellow didn't come around until 1958. Indigo is a very recent color, introducted in 1999. Red wasn't in the original box. They used English Vermilion and Indian Red in it originally. It showed up during the transition box in 1935. The color red has stayed consistent throughout. Red Orange, Red Violet, Violet Red, Yellow Green and Yellow Orange were all introduced in 1930 back when Crayola used a color wheel approach. Scarlet is also a more recent color coming in 1998 from the series of new color promotions they did back then. As you can see, the No 24 has a long history and the colors have not been static at all. 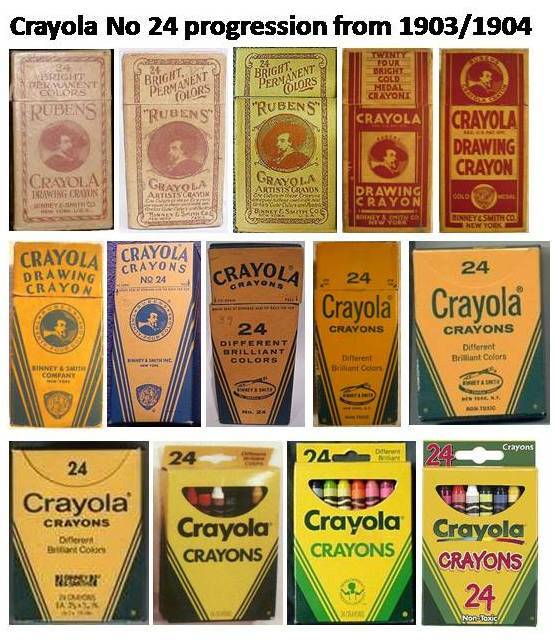 Crayola's color history is also much more complex than simply a few retirements. Renamings and disappearances were done throughout their history. In today's world, yes, they "retire" colors but it is no different than the dropping colors of colors from before except that now there is a big promotional production around doing so. And while you may be happy or sad on the color they choose to retire, understand it is merely a drop in the vast color ocean of changes that have been happening all along over their 110+ year history.